ROMA is gearing up for the saleyards most spectacular year to date in 2019. Not only will it be celebrating 50 years of operation, they will also be hosting the Australian Livestock Markets Association National Expo. The expo will incorporate the ALMA annual general meeting and will be an opportunity for saleyard and lairage owners and operators to visit Roma, participate in a tour of the saleyards during its redevelopment works, as well as touring beef enterprises within the Maranoa. 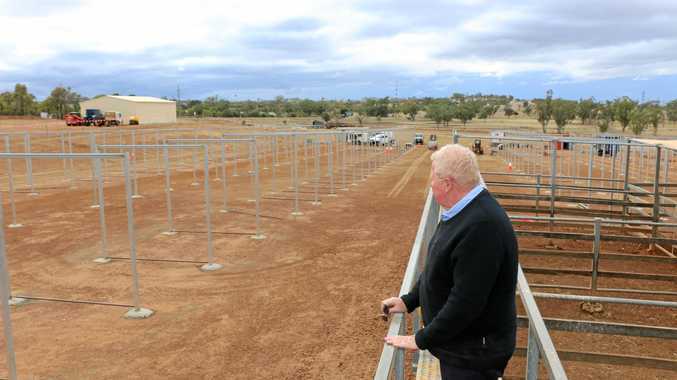 "2019 is going to see the combination of the replacement building of the new multi-purpose precinct at the saleyards to coincide with the saleyards existence of 50 years,” Councillor and portfolio chair for Roma Saleyards Peter Flynn said. Cr Flynn said an event of this calibre is traditionally hosted on the Eastern Seaboard and was a great achievement for the Maranoa. "The ALMA expo we have just come back from this year at the end of July, the range of speakers with regards to not only the saleyards, but the agricultural industry and the selling effects through the industry was outstanding and I believe we will be able to have at least the same quality speakers, if not better,” Cr Flynn said. The date of the 2019 ALMA Expo is set held in July 2019, with an expected 200 guests.